Serving our neighbors in need with kindness, respect, and dignity for all. 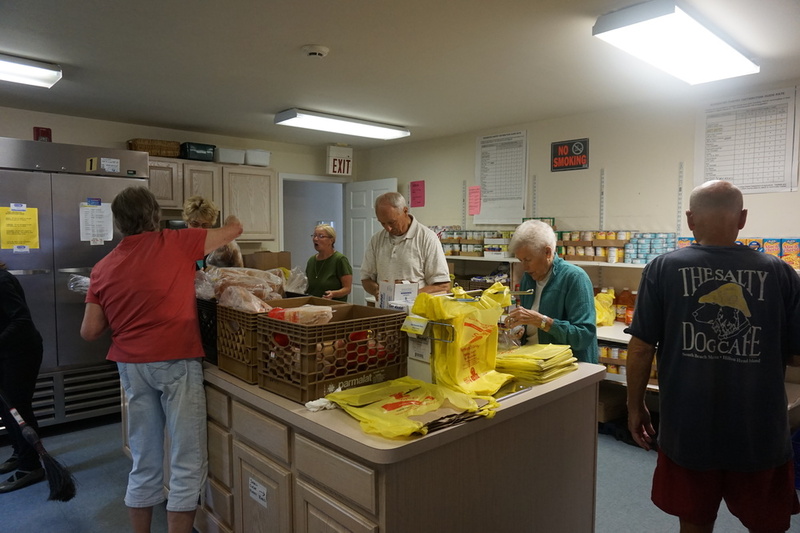 The Bradley Food Pantry serves those in need in the central shore towns of Monmouth County. We provide bags of food and are open Monday-Friday, 10 to noon. Serving our neighbors in need with kindness, respect and dignity for all. Founded in 1982, the Bradley Food Pantry provides bags of food to those in need five days a week, Monday-Friday, from 10 am to noon, and Thursday evenings from 6pm to 7pm. Clients are welcome to receive food once a month. Our primary service area are the mid-Monmouth shore towns of Asbury Park, Avon-By-The-Sea, Belmar, Bradley Beach, Lake Como, Neptune, Neptune City, Ocean Grove, Ocean Township, Tinton Falls, and Wall Township. We serve over 750 families every month -- more than 2000 people -- who are hungry when they arrive and receive two or three bags of groceries -- enough for three days for the entire family. We hope you'll want to join our effort to help those who are in need. Clients received two or three bags of food, depending on family size, once a month. Our volunteers devote countless hours to sorting and bagging food for our clients. Who is Eligible for Food? We serve those in need. If you are hungry, we have food for you. For regular participation, we assist residents of Asbury Park, Avon, Belmar, Bradley Beach, Lake Como, Neptune, Neptune City, Ocean Grove, Ocean Township, Tinton Falls, and Wall. Volunteer: The Pantry is staffed completely by volunteers. If you are interested in working in the Pantry during our open hours -- or have other time to offer -- please contact us by email. Donate Funds: While most of our food is donated, we still spend over $40,000 per year for food, utilities, and supplies. There are no paid staff. Please consider a donation. Donate Food: We can always use your donations of shelf-stable food and assorted toiletries. We can especially use pasta, dry beans, canned protein beans, cereal, tuna fish, toilet paper, and diapers. Thank you for your generosity.